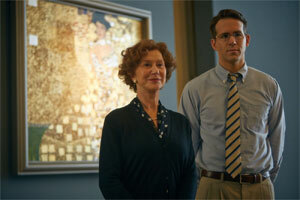 The story of how a persistent woman and her inexperienced young attorney manage to reclaim five Nazi-looted paintings by artist Gustav Klimt suggests a powerful drama dealing with the continuing reverberations of the Holocaust. Woman in Gold builds its story around one of those paintings, Klimt’s 1907 painting Portrait of Adele Bloch-Bauer. But if Klimt’s gold-leafed portrait deserves masterpiece status, the movie about efforts to restore it to its rightful owner feels like by-the-numbers, middlebrow fare. Helen Mirren brings the expected amount of wit and bite to the role of Maria Altmann, one of the few surviving members of a wealthy, cultured Viennese Jewish family. After the Anschluss, Maria and her husband escaped to the U.S. Most of the rest of Maria’s family was killed by the Nazis, who also looted the Altmann art collection, including the portrait of Maria’s aunt, Adele Bloch-Bauer. Years later, the Austrians have come to regard the Bloch-Bauer portrait as a national treasure. Referred to as “Austria’s Mona Lisa,” the painting carries a price tag of more than $100 million. Early on, Maria — already in her 80s and living in Los Angeles — hires attorney Randy Schoenberg (Ryan Reynolds) to help her retrieve the art, perhaps as a way of keeping her family heritage alive. The grandson of composer Arnold Schoenberg, Randy predictably resists — at least initially. Just as predictably, he becomes absorbed by the case, which slowly takes over his life. Bland to the point of blankness, Reynolds adds little to the proceedings. In another performance that hardly registers, Katie Holmes plays the attorney’s wife. Working from a screenplay by Alexi Kaye Campbell, director Simon Curtis (My Week With Marilyn) adopts an overly familiar structure, juxtaposing action in the present with war-time flashbacks in which Nazis move toward annihilating Vienna’s Jewish population. The best of these flashbacks show the lavish pre-war lives of a well-assimilated Jewish family that sees itself as a part of the city’s fabric. Max Irons portrays Maria’s husband, an opera singer, and Allan Corduner appears as Maria’s father, a man who can’t quite believe that his secure position in Vienna could crumble so quickly. As Aunt Adele, Antje Traue brings vibrant sophistication to the role of the woman whose portrait is at the movie’s heart, and as a young Maria, Tatiana Maslany embodies the tension and fear that’s being inflicted upon Jewish families. Though well-shot, the movie’s flashbacks tend to be overused and telegraphed. An example: To pursue the case, Maria reluctantly agrees to return to Austria. After a meeting with Austrian officials, she tells Schoenberg she wants to walk back to her hotel alone. It almost seems as if she’s excusing herself so that she can have another flashback. Curtis does a reasonably good job of guiding us through the legal tangles surrounding attempts at restitution, battles that involve Austrian committees and art bureaucrats, as well as a 2004 appearance before the U.S. Supreme Court. An Austrian arbitration panel finally brought the case to its conclusion in 2006. In Vienna, an Austrian journalist (Daniel Bruhl) helps Maria and Randy in their battle, but this character also could have used more fleshing out. The issues involved in Altmann’s story are rich enough: Maria’s understandable resistance to setting foot on Austrian soil and unresolved questions about how much Holocaust awareness depends on a vanishing generation of survivors. Rather than allowing these issues to open up for us, Curtis keeps them encased in a drama in which they don’t fully resonate. Woman in Gold isn’t a bad movie, and its story is interesting enough to keep us engaged, but it needed more than dogged competence to give startling new life to the horror and injustice that are so much a part of this tale.